Before cross-platform mobile app development frameworks came around, developers had to develop apps for each and every platform separately. Thus, it took a lot of time to develop apps for multiple platforms. To reduce time, frameworks were made to make cross-platform mobile app development less time-consuming. This led to the development of cross-platform mobile app development frameworks. Cross-platform mobile app development allows the developers to use a single language to make codes for different devices. It is preferable to code Android apps with the help of Java, while for iOS apps it is preferable to use C or Objective-C. Cross-platform mobile app development frameworks save the programmers the trouble of learning multiple languages. Through these frameworks, programmers can easily write a single code using a single language. This code would act as up to 96% of the total code since some of the functionalities need a special set of codes in the native language of the OS. But the fact that up to 96% or more of the code can be used in all the platforms itself is an achievement and something to rejoice for the programmers. There are a lot of frameworks available in the market but the one we found best is Xamarin. It is a unique tool using a single language, C#, for creating apps for all the mobile platforms. It is natively compiled, unlike a close competitor, Appcelerator Titanium, which is interpreted. This makes it the best option for developing high-performance apps without missing the native look and feel. It was built by an open source development platform Mono’s developers. Unlike Mono, Xamarin was developed as a commercial project. But that was until Microsoft acquired the company. Once acquired by Microsoft in February 2016, the company’s licensing policies were revised. Post-revision, Xamarin SDK, including command line tools and libraries, became open source as a part of Visual Studio, under the MIT license. This led to an unprecedented growth of the platform. Supported by JetBrains, Unity, RedHat and the .NET Foundation, Xamarin has become a highly powerful and reliable tech stack. Based on web technologies, any cross-platform app developed with Xamarin can be classified as native, unlike the traditional hybrid solutions. The performance of these apps is comparable to those of Swift or Objective-C for native iOS app development, and Java for Android. Xamarin constantly improves the efficiency to match the latest standards of native app development. In addition to the services provided in Xamarin, it allows paid users to pair Xamarin Test Cloud and Xamarin Test Recorder to identify performance issues before the release by running automated UI tests. When it comes to creating flawless experiences with the help of platform-specific UI elements, nothing comes close to Xamarin. It is simply the best. Xamarin.Forms is a tool which allows developers to build simple cross-platform apps for Android, iOS, and Windows. At runtime, the tool converts UI components of the app into platform-specific interface elements. Using this tool significantly increases the pace of app development, which is great for business-oriented projects. Due to an extra abstraction layer, however, there might be a slight decline in performance. For higher performance and custom app UI, you could use Xamarin.Android and Xamarin.iOS separately to ensure best results. Xamarin uses C# supported by .NET framework for creating apps for all mobile platforms. You can easily develop all of your Xamarin apps within the environment provided by Visual Studio. Hence you don’t need to switch between environments while developing your Xamarin app. Cross-platform development tools are supplied at no additional cost as a built-in part of the IDE. Xamarin eliminates all possible hardware compatibility issues with the help of plugins and APIs. Along with access to platform-specific APIs, it supports linking with the native libraries, thus allowing native-level functionality and better customization with very little overhead. Xamarin makes updates and maintenance easier since it is a cross-platform application. To update, you can easily deploy the updates to the source file and the changes would be applied to both iOS and Android apps. This saves a lot of time and money while at the same time your apps are kept up to date. It’s not always rainbows and butterflies when you work with Xamarin though. 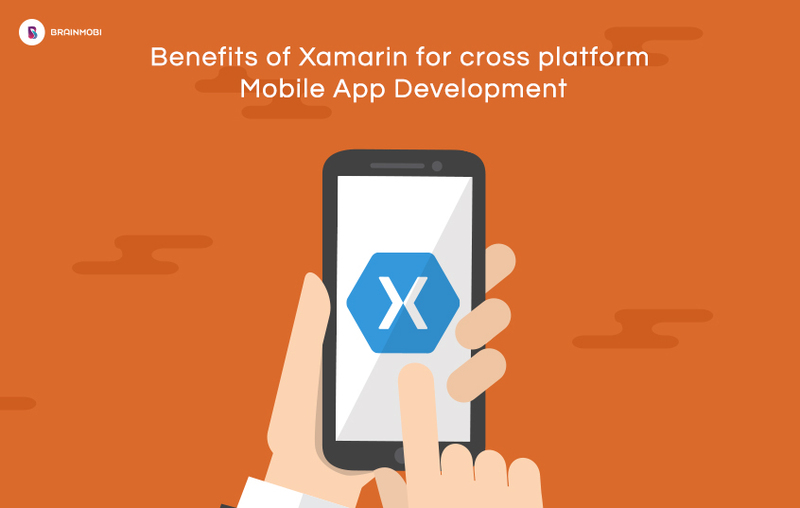 There is limited access to open-source libraries and a slight delay in support for latest platform updates, but when it comes to finding the right framework for cross-platform mobile app development, Xamarin is a name that stands out from its competitors, just like BrainMobi does when compared to other mobile app developers. We are a leading cross-platform application development company. Our cross-platform application developers are experts in mobility. We provide the best services you could ask for. Connect with us at sales@brainmobi.com to let experts handle your cross-platform application development needs. Found it informative? Spread the word! Also, let us know your thoughts about the post in the comments below. Stay tuned to learn more.